See how Parkmerced is creating a whole new kind of community in San Francisco. Parkmerced is creating a whole new kind of community in San Francisco by transforming one of the city’s most unique neighborhoods into a sustainable, pedestrian-friendly community. We’ve worked with our residents and neighbors to bring together the best and the brightest in their respective fields to reimagine the way people live and connect in an urban environment. It is a new kind of urban living — a city within a city. At Parkmerced, nothing is impossible. Click here to view highlights from The Complete Vision. You can also click on the blue animated hotspots to bring up key highlights from each page of the deck. The main goal in re-inventing Parkmerced is to craft a vibrant, pedestrian focused neighborhood where public spaces and buildings frame a comfortable public realm and make a positive contribution to the ecological and social health of the region and the city. Parkmerced embraces a new paradigm, where open spaces are meant to provide benefits for both people and the functioning of ecological systems. Meandering pedestrian paths surrounded by a large recreational lawn area for community activities and gatherings. North-South Streets are lined with tall trees, oriented to block the salt-laden westerly winds. Places for residents of Parkmerced to gather, the Neighborhood Commons are active open spaces dedicated to social engagement and recreation. Rainwater is channeled through a new stream corridor, filtering water to reduce the impact on the City’s waste water treatment plants, while restoring a connection to Lake Merced. Sports fields offer residents of Parkmerced the opportunity to participate in active recreation. 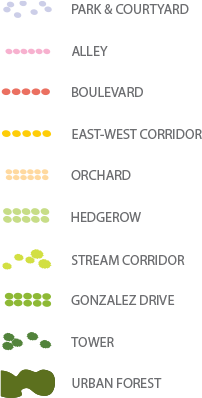 Connecting the eastern and western edges, Parkmerced’s Gonzalez Drive weaves through the neighborhood, creating a robust green link for people, water and habitat from SFSU to Lake Merced. Neighborhood streets are designed with the minimum travel lane dimension to help enhance the pedestrian scale. Travel lanes are widened only on street-designated bus and truck routes, or to meet Fire Department standards. As the primary access street for Parkmerced, Gonzalez Drive orients residents and visitors, making finding your way through the neighborhood easier and more convenient. Similar to other San Francisco neighborhood-serving retail streets, Crespi Drive provides convenient access to services and amenities, increasing the community’s livability. Walkways that cut through the middle of the blocks provide a variety of engaging routes for pedestrians and cyclists to choose from as they move through the neighborhood. Alley ways are intended to be streetscape environments where auto traffic is slowed and pedestrians have priority. Their design helps dissipate persistent westerly winds with a row of taller, wind deflecting trees, while collecting rainwater into a network of biogutters. Focusing vehicle access to these North-South Streets allows other streets to be calmer and more pedestrian focused. 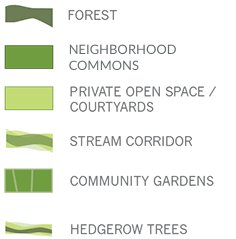 When Parkmerced was first constructed, much of the natural habitat and biodiversity was built over. The Vision aims to repair this by day-lighting the flow of rainwater runoff as it passes through the site. Replacing typical gutters and storm drains, a network of bioswales and biogutters makes rainwater an integral and visible part of the streetscape. The backbone of the site hydrology, the Stream Corridor is a rich habitat attracting an array of native wildlife from insects to birds. 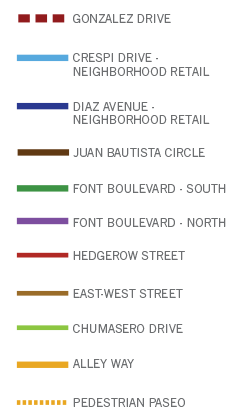 Collecting rainwater helps establish a healthy ecosystem to supply irrigation to plantings within Juan Bautista Circle and flow further into the stream corridor. The Parkmerced micro-climate is the dominating factor in guiding tree selection. The frequent cold, salt-laden wind determines what will succeed and where. Native species have been selected to work with the natural hydrology of the site, requiring little irrigation. This area will be used as a nursery to grow trees that will be moved elsewhere on the site later. This is done to acclimate the plants to this climate and soil before putting them into their final location, as part of our Tree Replacement Program. Some of the new buildings at Parkmerced will require some trees to be relocated. In the event that a tree cannot be relocated and must be removed, Parkmerced will replace every tree that is removed with three new trees elsewhere on the site. Retail on the ground floor with professional offices above, the Parkmerced social heart will include a neighborhood serving market and other retail, making it convenient for Parkmerced neighbors to walk or ride a bike for daily errands. Living well and being well are critical not only to sustain life, but for life to thrive. A community fitness center will provide opportunities for recreation and social interaction. Evenly distributed throughout Parkmerced, neighborhood commons will be social gathering places anchored by small retail shops, business centers for work at home, outdoor activities, bike and car share pods. 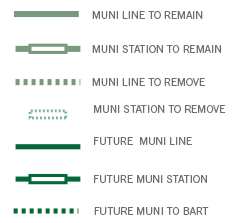 Making mass transit a more viable and convenient option, the new Muni stops are intended to be within a comfortable 10-minute walk for all residents. Incorporating a relocated stop for the M-line into a new transit plaza with connections to bus lines and a new shuttle route that connects to BART makes transit more convenient for residents and neighbors of Parkmerced. The light rail tracks for the M-line on 19th Ave, between Crespi Drive and Junipero Serra Blvd., are proposed to be relocated so the train engages Parkmerced. The potential for a future extension of the light rail tracks would connect to Daly City BART, providing a transit link to the entire Bay Area. Providing viable transit options at Parkmerced makes getting out of the car more convenient. A low-emissions shuttle to BART provides residents of Parkmerced with a direct transit connection to a regional rail system. Parkmerced offers residents monthly transit passes, pre-loaded with free rides for a multiple of transportation options. The new transit plaza makes connections to light rail and BART more convenient for all transit riders in this part of the city. 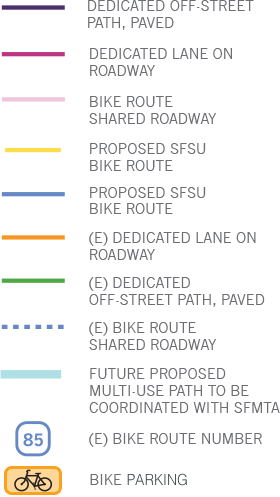 Linking into San Francisco’s existing bicycle network increases the connectivity between Parkmerced and the rest of the city and offers residents a viable option for bicycling to meet their daily needs. Tapia Street is designed as a bicycle boulevard that offers a dedicated bicycle path for enhanced enjoyment and safety. Whether heading to work or to a picnic at Lake Merced, a network of bicycle libraries makes it more convenient to get out of your car and ride a bike! Streets are designed to ease vehicular movement through the neighborhood by increasing access to the site and providing a clear hierarchy between primary access and neighborhood streets and create a much safer and inviting pedestrian realm. The 19th Ave corridor will have improved pedestrian safety and neighborhood access by introducing new, northbound left turn lanes at Chumaserro Blvd. New landscaping, street furnishings and traffic improvements along this stretch of 19th Avenue and Junipero Serra Boulevard, between Crespi Drive and Brotherhood Way, will help to stitch together neighborhoods on both sides of this major corridor. Three new intersections along Lake Merced Blvd. increase the overall accessibility to Parkmerced, helping to reduce congestion at any one intersection. North-south streets act as secondary access roads focusing auto traffic along a limited number of streets as they pass through the neighborhood. In order to help make the street pattern at Parkmerced more legible, Gonzalez Drive provides a much needed neighborhood throughway from which all streets at Parkmerced can be accessed. Adding dedicated merging lanes on Junipero Serra Boulevard and BrotherhoodWay and improving sidewalk areas will make this interchange more pedestrian friendly while improving traffic flow. The parking strategy at Parkmerced is intended to reduce the visual impact of parked cars on the pedestrian environment while simultaneously encourage the use of other forms of mobility. Locating the majority of parking stalls on the west side of Parkmerced, away from transit encourages people to think twice before getting in the car to go to the grocery store. Strategically located throughout the neighborhood, carshare “pods” will provide residents of Parkmerced with various types of cars for a range of uses, such as a regional outing or moving furniture. Many blocks located in the neighborhood “social heart” will not include parking at all, allowing courtyards to be truly on grade and reducing the amount of cars in the center of the neighborhood. 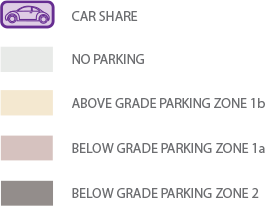 The vast majority of parking is located below grade, allowing for a seamless ground plane, uninterrupted by parking lots, parked cars or unsightly parking structures. The Parkmerced Vision is to interconnect a mutually supportive network of urban and natural systems intended to reduce overall resource consumption. 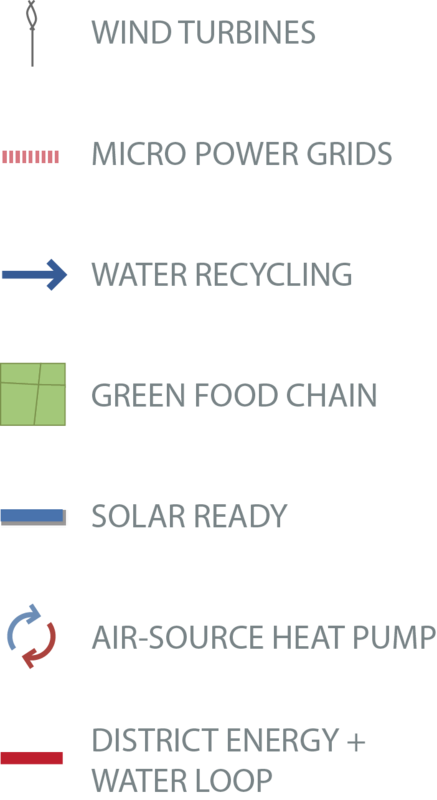 Within each block is the potential for the creation of a small scale energy grid, complete with cogeneration equipment that convert waste heat into a useful energy source. Parkmerced will install a dual plumbing system for recycled water. When available, recycled water will be used for irrigation, laundry and toilet flushing. Each building at Parkmerced will be designed to have at least 50% of its roof area to permit installation of south facing solar collectors. Utilizing waste heat from commercial uses to help heat water as it passes through the District Water loop helps reduce unnecessary consumption of natural resources and provides cooling for retail. Built in the 1940s, the Parkmerced of today consists of 3,221 apartment homes on 116 acres. There are 11 towers with 153 apartments each and 1,538 townhouse apartments. Phases 1A and 1B are expected to break ground in Winter 2016 - Spring 2017. These phases will include a total of 1,013 apartment homes among 5 new buildings. 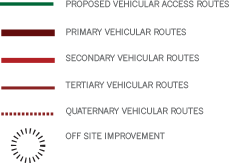 Construction of Subphases 1C and 1D will not begin until 1A and 1B are complete. Existing residents of the blocks within 1C will then have the option to move into a newly constructed unit within Subphase 1A. Existing residents of the blocks within 1D will then have the option to move into a newly constructed unit within Subphase 1A. Parkmerced has always been a special place. Originally designed in 1942, it was a valiant attempt to recreate the values of suburban living in the city, where everything was built around the car. But times and values have changed. Welcome to the new chapter.